Teaching may be one of the only professions where it can be more work to stay home sick, than to just suffer through and go to work. Writing good plans for a substitute teacher can feel like an impossible task when you are sick. 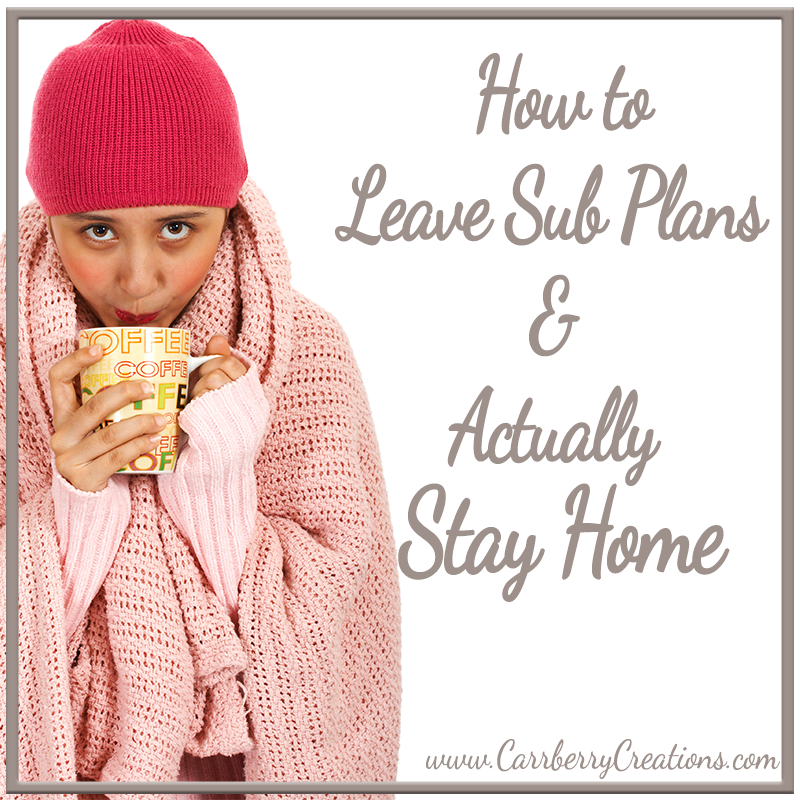 Today I’m going to share with you some tips and tricks I have learned over the years for how to leave Amazing Sub Plans without staying up all night. First Assemble a Substitute Information Folder for Any Sub Day. Phone numbers for the office, nurse, and grade level teachers. Location of extra work in case the sub runs out or doesn’t understand the assignment. The location of the staff lunch room, and bathroom. A form subs can use to report to you about how the day went. There are 2 different kinds of sub plans and they require very different planning work from you. The plans you leave for a sub when you know in advance that you will be out should, for the most part, stick to what comes next in your curriculum. This does not mean you leave the lessons written just as you would complete them, from the prescribed curriculum. However, this is a great time to include some review work that ties closely to the next lessons in your regular curriculum. For example, you may be working on reading a novel as a class, and you want students to focus in on a few key points in the next chapter. First, ask yourself if they will get to practice this same skill in a later chapter while you are present. Most subs, are not certified teachers and will not have the same understanding of the lesson goals you have. It is important that you leave a lesson that relies heavily on routines and review for your students. Save the new stuff for when you are there. Be as explicit as you can be in your sub plans about the location of the materials needed for the day. I have found the most success with stacking the day’s work in order with all the manipulatives, books, and materials needed for the day beside it. Then I put my sub information folder on top. If you have any work on your desk for other days in the week put it away. I have experienced an overwhelmed sub passing out all the homework for the next 2 weeks, and sadly, I am not alone in experiencing this type of thing. If it doesn’t need to be on your desk, hide it. Leave a few folders of extra work. In my sub tub I have folders for extra work. Each folder is labeled with a subject area. At the beginning of the year I copy 1 worksheet (1 for each child) for each subject and put them in the folder. Whenever I have extra work we didn’t get to, I stick it in the folders. Subs can grab this extra work to give to students if they run out of work, or didn’t understand the directions for a lesson etc…. To be honest, sometimes when I’m not “feeling it” for the day I pass these out so I can have a few minutes to refocus for the next lesson. The sub plans you leave for days when you are sick are the ones that can keep you up all night. When you knew you were going to be out in advance you had time to leave detailed plans, and stack everything nicely on top of your desk, but it never fails that when you spike a 102 temp it’s in the middle of the night, and you don’t have time, energy, or focus to get plans in on time. In this case advanced planning is your friend. First get yourself a tupperware tub or file crate that can hold enough worksheets to last for 2-3 days. Then put a copy of the Sub information folder you already made in the front. Behind the put all those folders of extra worksheets for every subject, along with a couple of read-aloud books that are not season-specific. 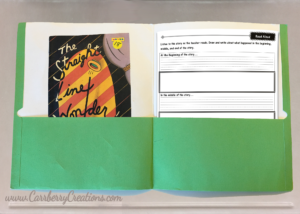 (You may want to pair each read aloud book with a retelling worksheet that can be used after reading.) On the cover of each of the work folders write the time of day that subject is generally taught, and then place these folders in order in the crate. I tend to use those a lesson plans of last resort. At the start of the school year I make up emergency sub packets for days like this. In an emergency I do not want to have to come into my classroom to leave out manipulative or supplied for activities, instead I leave a worksheet packet. Boring I know, but it makes classroom management for the sub easier, and I don’t have to go in to set up at all. To do this chose 1-2 worksheets for students to complete for each lesson of the day. Make sure that the sheets are meaty and will take students time to complete. Include a poem or short story for shared reading. Instruct the sub to select one of the books in the sub tub for read aloud (or in the upper grades have students read independently and complete a reading log or retell sheet to go with their reading. (Choose retelling because no matter what book they read, regardless of genre they can always retell what they read. That is not always true for other comprehension strategies). I write which subject each sheet goes with at the top of every page. Then I put the sheets in order according to our schedule, and run a packet for every child. I put sets of these packets in my sub bin and extra days worth are in the cabinet below. If I am out sick my neighbor-teacher makes sure that my sub finds the packets and my sub information folder. No more coming in sick for me! If the process of assembling a sub packet is just not something you have time for right now, please come check out my emergency sub packets in my TpT shop. You can get them in 3-day sets or a 9-day bundle at a discount. 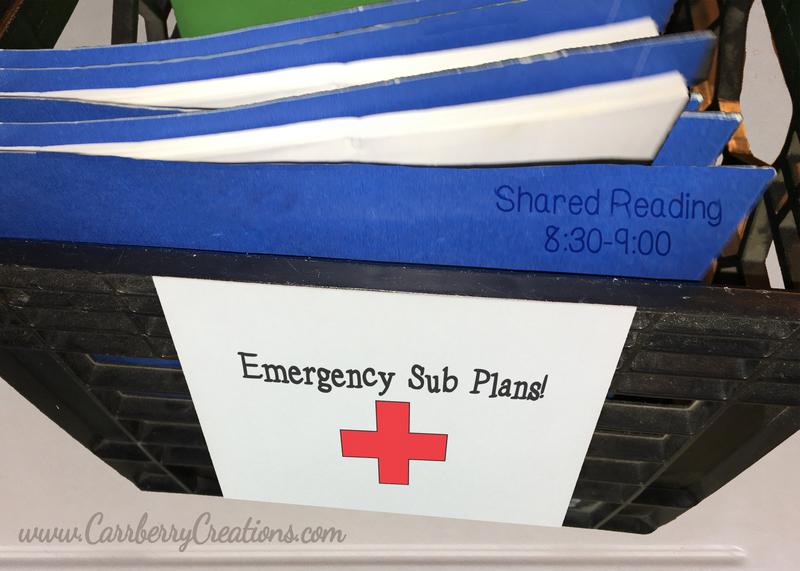 Leave emergency procedure information in your sub plans. Include where students should go for a lockdown drill with exactly where you take your students. Most subs were never teachers, don’t assume they understand what the lesson means. Leaving mostly review work, can help alleviate you having to go completely over the lesson you left the day you return. Leave behind some things subs can use as a reward for good behavior. PBIS tickets, stickers, or a game such as BINGO, are all good choices. Whatever you leave behind be sure to leave the sub guidelines for the appropriate use of the reward. Leave a pull out schedule for your sub so they will know where students are when thy are not with you. Planning ahead for an emergency day can save you so much time and energy when you need it most! These are GREAT tips! Thank you for linking up with my Teaching Tuesday link up party. I am sharing this post across my networks. Thanks!